The world of social media is always abuzz with a variety of topics. This time of year there are many postings on the nearly endless list of blooming flower which are brightening the landscapes all over north Florida. The polychromatic displays are located high and low, in residential and rural areas and seemingly without end. The blooms foretell the likelihood of the next generation of plants, but are also an essential resource for many insects in the spring. A grouping of insects commonly known as pollinators is currently busy collecting nectar and pollen for their own use. By doing this task necessary for survival, they assist the currently blooming plants and trees with successful pollination. European Honeybees are the most commonly known pollinators, and considered by many to be the most efficient. As the name suggest, European Honeybees are not native to North America. There are some historical records indicating European Honeybees were brought to the New World in 1607 aboard the 38 foot English ship Discovery. The Discovery was one of three ships used to found Jamestown, Virginia, and its likeness is displayed on the 2000 quarter dollar coin’s reverse. Life for the early settlers was harsh and devoid of pleasures. Food, when it was available, was bland in appearance and flavor. Honeybees provided us with the one sure option for improving the paltry diet. Additionally, in the early 17th Century bees required much less work than other livestock. Let us not forget to mention adding much need flavoring to the settlers’ diet, honey had numerous other uses. It was the basis for alcoholic beverages and a wound dressing, just to name a few. Soon, likely the next spring in Jamestown, some of the European Honeybees escaped into the wild and located new sites for hives. Hollow trees were quite popular, offering the colony living space and protection from animals which preyed on insects. The hive splitting process is normal behavior for honeybees in the spring, especially when they have outgrown their current residence. A new queen is produced and she leads some the swarm to a new residence. Sometime the departing swarm will temporarily stop on a tree limb. If the area offers shelter and promise, they will stay. Commonly, it is just a rest stop to assess the area and the swarm moves on after the rejection. The European Honeybees are completely oblivious to human occupation when selecting an area to assess for colonizing. The rest stop may be in the forest, a yard within a subdivision, or a parking lot full of cars. For the uninitiated, the seemingly sudden appearance of bees may be a bit disconcerting. These insects will closely buzz by anyone or anything venturing too close to the swarm. Perfumes and colognes will attract some additional attention from the bees. But the purpose of the feral swarm’s rest stop is to assess the area, not terrorize the vicinity’s residence. Their objective is to collect pollen and nectar, and by default improve the pollination process for all the plants in the area. While the early Jamestown residents did not recognize the value of their honeybee’s pollination services, modern agriculture does. Billions if not trillions of European Honeybees are trucked cross country to pollinize such diverse crops almonds, blueberries, watermelons and many others. Spring literally hums with activity, and the European Honeybees are the lead vocalist. 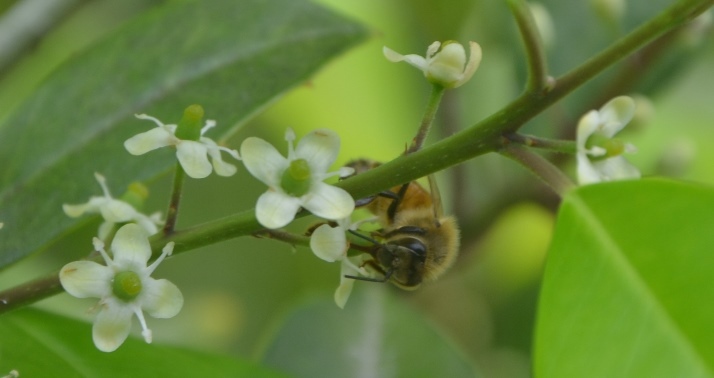 To learn more about European Honeybees and other pollinators in north Florida, contact the local UF/IFAS County Extension Office. Click here for contact information.